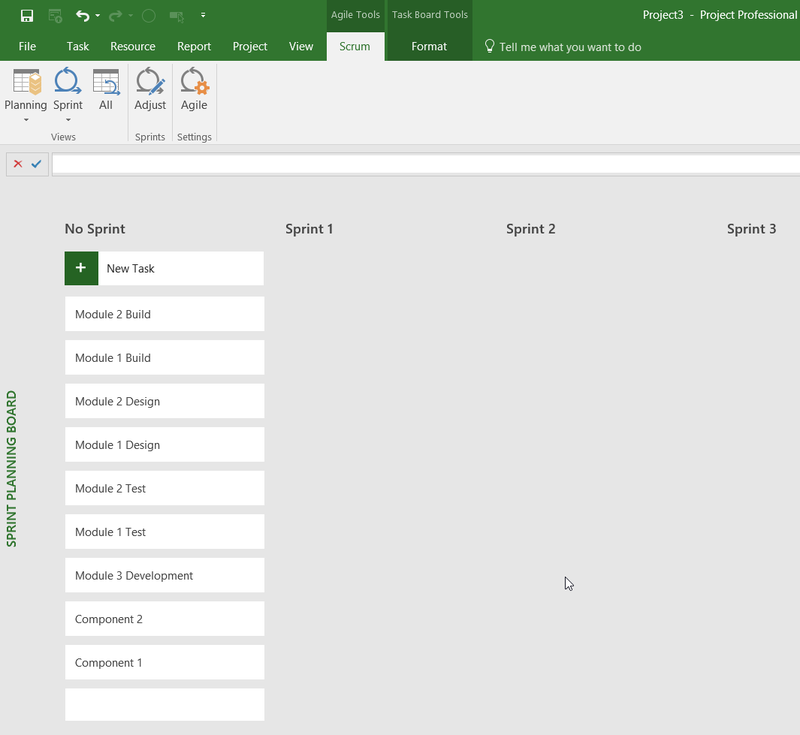 First off, I just want to thank Brian Smith and the team at Microsoft who have listened to feedback and incorporated Agile into Microsoft Project. We have been waiting for a while for these new features, so I have been working hard to figure out how everything works since their release. In this blog, I will introduce you to the new functions and show you how they work. If you don’t see them in your version of Microsoft Project 2016, you will need to update Office. The Agile functionality does not change the way that you will use Project for day-to-day scheduling; it merely provides additional tools that can be used to help you plan and organize your projects. If you don’t need a detailed Project Schedule with tasks, summary tasks, milestones, detailed resource assignments, etc., you can opt to just use the new Agile features and ignore everything else behind the scenes. This is pretty key, as it opens up Microsoft Project to the masses who just want a very high-level plan. If you are observant, you may have already noticed the three new templates that appear when you click on “New” from the backstage. These templates essentially represent three different “methodologies” that your project can follow: Scrum, Kanban, and Waterfall. Let’s start with a new Scrum Project and see what we get. The most notable thing that you will be presented with is the new “Sprint Planning Board.” In the screenshot below, you will see how I have added new tasks within the “No Sprint” section. This is the only area in the Sprint Planning Board where I can create tasks. When you add tasks to the Planning Board, behind the scenes, the tasks are added to the Project Schedule in the order in which you create them – essentially reversed. The same applies if you create tasks within the “Gantt Chart” View; they will show up in the No Sprint section of the Sprint Planning Board. The next thing we need to do is put a timeline to our sprints. Most companies that I have worked with use a two-week sprint planning window, and you can see below that the default sprint duration is two weeks – but you can update this if you would like. Once you have set your sprint durations – which can vary – you can specify the start date of the first sprint. 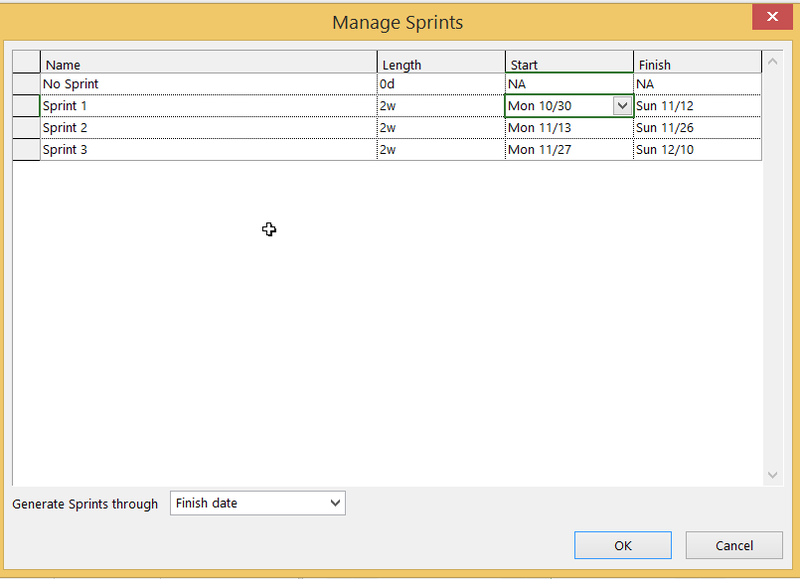 All the other sprints should be automatically calculated based on this first sprint date. In the example below, I started my first sprint on 10/30. 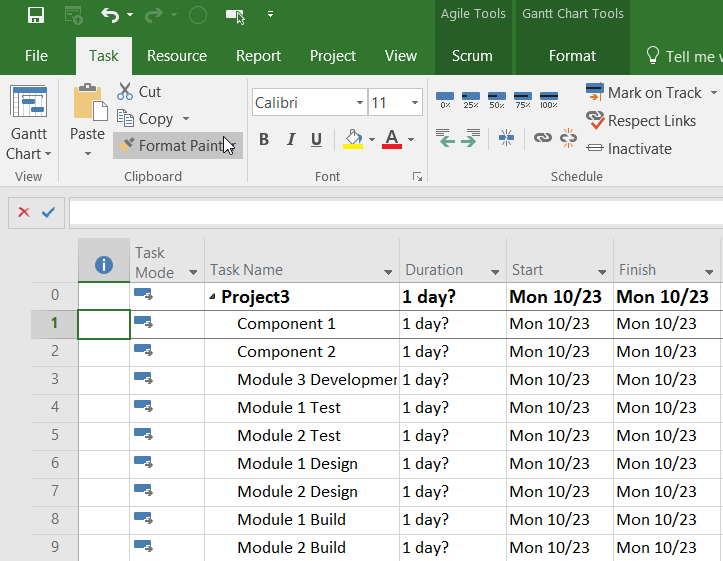 To move tasks between sprints, you can drag and drop them within the Sprint Planning Board. 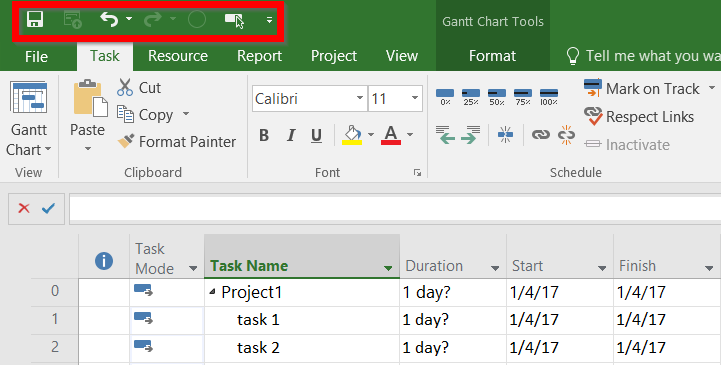 Note: At this time, the task dates will not be updated within the Gantt Chart View to reflect the sprint dates – even though we know the dates of each sprint. 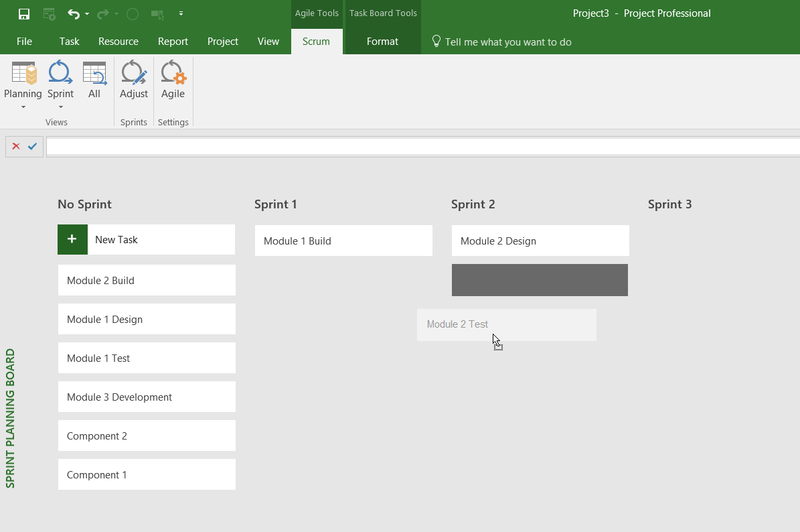 At this point, you can also use the “Agile Tasks” View to move tasks between sprints by using the “Sprints” column. You can also estimate the “Work” and “Board Status” (e.g., “Backlog,” “Next Up,” “In Progress,” and “Done”). Another new column you will see is “Task Summary.” You may think this is an area to summarize the task, but it is simply the name of the associated summary task. Now that we have our sprints arranged, we can start managing the project. Note: For those with a keen eye, you will remember that I originally set Sprint 1 to start on 10/30. I tried setting the “Status Date” to 10/30, but it didn’t make my Current Sprint Board display the current sprint. I had to change the dates of Sprint 1 to continue with this blog. 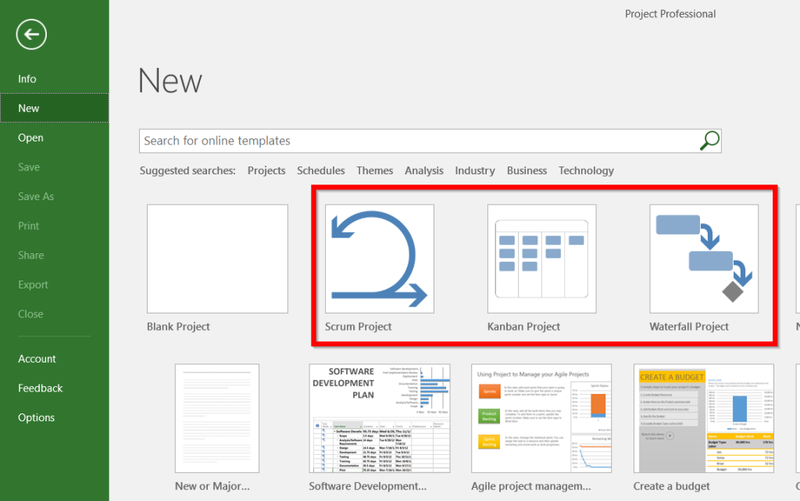 If you are currently using Project and want to switch one of your existing schedules to an Agile project – or if you want to switch from Scrum to Kanban – you can do this from the “Project” ribbon. When switching to Kanban, you will see very similar features to Scrum. In fact, feature-wise, Kanban is just a subset of Scrum. 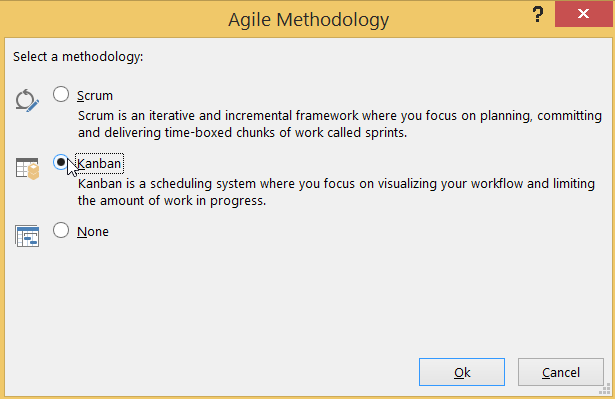 Scrum has the Sprint Planning Board View that allows you to select which sprint certain tasks fall under. Kanban doesn’t have this; it just has the “Backlog Board” View – which is exactly the same as the “Current Planning Board” within Scrum. If you think about it, Scrum is for larger, more in-depth projects where you are planning and managing multiple sprints. Kanban, on the other hand, is good for smaller, less-complex projects that can be planned within one board. You can see that the “Backlog Sheet” is very similar, with a couple of the Scrum-related fields removed. Selecting a Waterfall Project doesn’t really do anything other than remove some of the Agile ribbons. If you select it, I did notice that you can still access some of the Views that are relevant to Agile Projects. If you’re looking for a hybrid methodology, though, I would recommend either Scrum or Kanban just so that you can access the necessary ribbons. There are five new “Agile” reports that go hand-in-hand with Scrum and Kanban. My first impression of these reports is that they look good and they work very nicely with the Agile components. 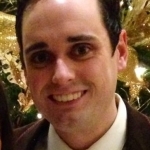 I hope this blog has given you a good overview of the new Agile features. Please let me know if you have any questions or comments! If your organization is considering a migration to Project Online, contact us today. We’d love to show you everything that Project Online can do for your PMO.